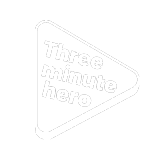 Share your story and be a Three Minute Hero! 4 What is your advice? Please watch the video to see the kinds of questions students want to know about your job. Including the perks, the best and worst bits, how you got there and your typical day. Please start your video with your name and the job you do. Step 2 - How was school? Watch the video to see the things that students want to know about how important your education was in your career journey. Think about your time at school? What were you like? What subjects are now relevant to your job? Step 3 - What else helped? Watch the video to see the questions that students have in respect of other factors (outside education) that influenced your career path. How important is it to build a network? Is it important to do part time jobs? Is it who you know or what you know? Step 4 - What is your advice? Watch the video to see the questions students want answering around the advice you would give to them or to your teenage self. The best advice you have ever been given? Did you do any terrible jobs to get to the job you now do? Who or what inspired you? Knowing what you know now would you have chosen a different path?